A different kind of intruder setting off the burglar alarm? Have you experienced any odd occasions where your alarm has been triggered for no apparent reason? Your panel may identify which sensor has been disturbed but there’s no obvious reason why? It could be that you have been a victim of an intruder of a different kind: a giant spider! While Halloween may be an appropriate time of year for ghoulish arachnids and spooky cobwebs it’s actually warmth and romance that are tempting the 8 legged beasts into our homes! As the weather turns chillier and male spiders reach maturity, they come into homes to seek out female spiders. This may be setting off alarm bells for you – literally! Some are so big that they’re setting off burglar alarms! Actually, in reality they don’t have to be huge to do this; all it takes is a spider to crawl directly over a sensor to fool it into thinking there’s some kind of intruder. When you consider that a burglar alarm sensor’s job is to detect movement at a distance of several feet, something moving over its direct surface is going to trigger it just the same. Setting your alarm off is a bit of an inconvenience and the spiders aren’t harmful but it can be annoying for neighbours (especially in the middle of the night when spiders tend to be most active), false alarms will reduce the chances of anyone responding to a genuine alarm and if you’re out of the house at the time it could be going off for a while. There are, however, a number of things you can do to prevent this happening. If you are getting repeat false alarms there may of course be something else going on. We can take a look and test the system to find out what the issue is and get that sorted for you. 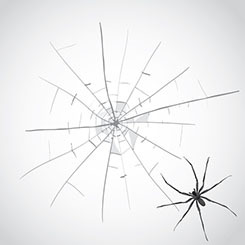 Just call us on 0345 833 5543 (though we’re not sure our engineers are up for catching spiders! ).